Rabbi Goren, holding the rank of general, was serving as the chief chaplain of the Israel Defense Forces (IDF) during the June 1967 Six-Day War. Among the first forces to arrive at the Western Wall, he proceeded to conduct the first Jewish prayer service held on that spot since 1948, his voice going out live by radio to a nation already being swept up in nationalistic euphoria. It was a riveting moment. 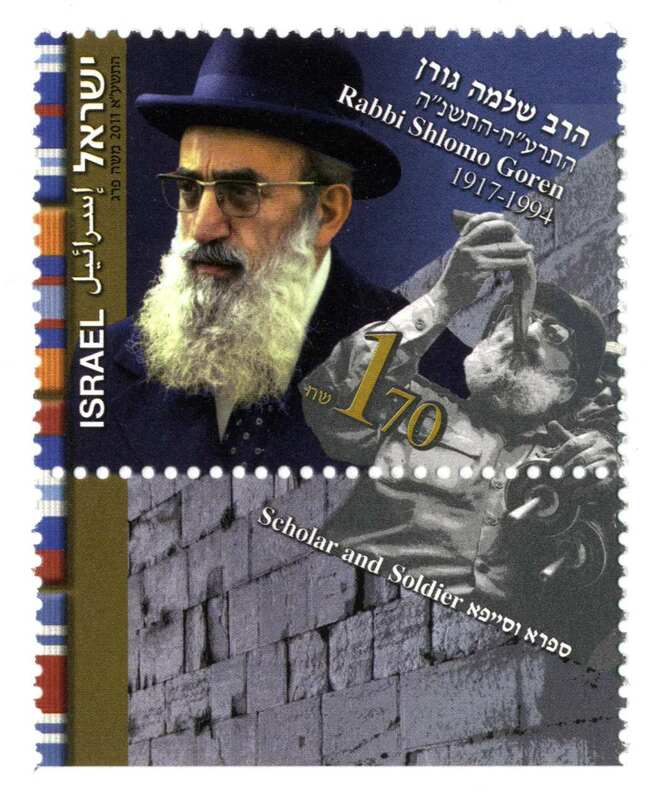 Thus the stamp’s design features (in addition to Goren’s amassed campaign ribbons, down the left-hand border) the iconic photograph of him in front of the Wall, carrying a Torah scroll and blowing the shofar. Shlomo Goren inside the Dome of the Rock, 07 JUN 1967. 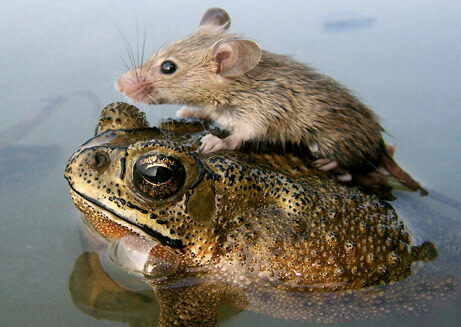 This rare image is from a film discovered in IDF archives only in 2006; the film had been censored and was never released. 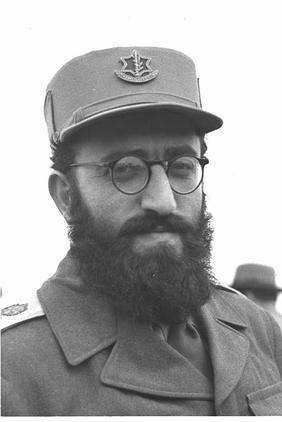 One of the most vocal and visible advocates of the imperitive to hold on to the territories was Shlomo Goren, the chief rabbi of the IDF… Equipped with his shofar and military rank, Rabbi Goren traveled the territories sharing with soldiers his belief that the State of Israel existed thanks to an unshakable divine mandate and that the IDF was implementing the prophets’ predictions for the end of days. “The divine spirit, which has never left the Western Wall, now walks before the armies of Israel in a pillar of fire to light our way to victory,” he said when he reached the wall with the first of the soldiers. 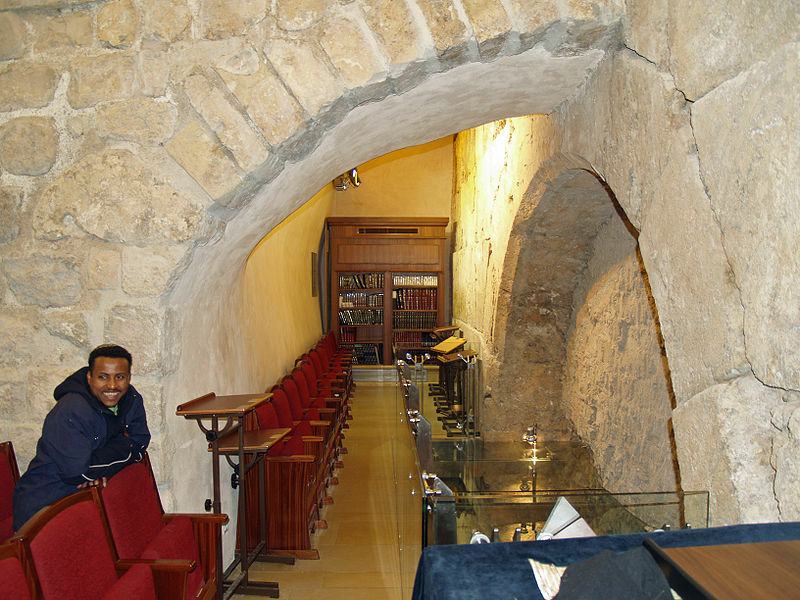 Over the next weeks he blew his shofar all over the country, from Mount Sinai in the south to Mount Hermon in the north. 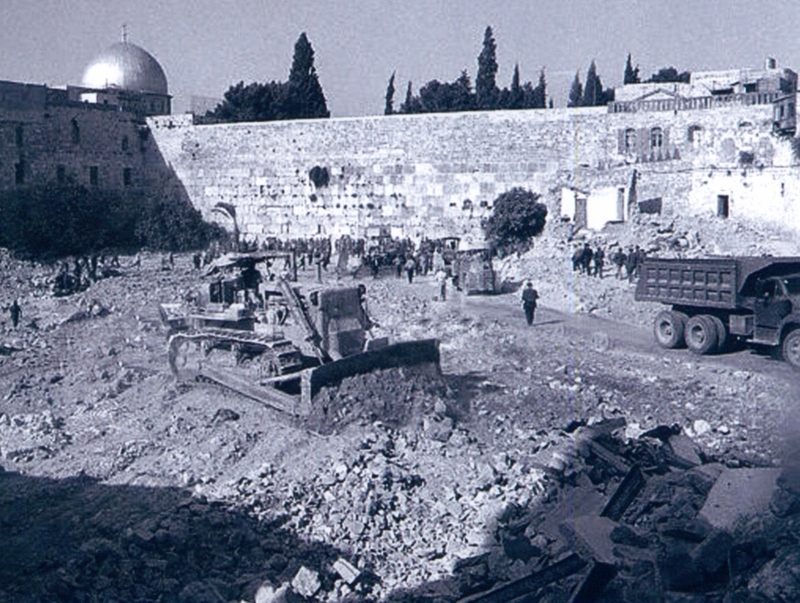 On August 10, Goren came to the Temple Mount and found the gates blocked. He and a group of soldiers began to [and did (tp)] break the gates down so they could enter and pray, thus reoccupying the compound from the Muslims. From the moment Moshe Dayan had been wise enough to order the removal of the Israeli flag from the Dome of the Rock, immediately after the occupation, Israel had in fact conceded the Temple Mount to Muslims. The chief rabbinate ruled that Jews were not permitted to go to the mount lest they accidentally desecrate the site where the Temple had stood, which would be a sin. The government decided that Jews who tried to pray there would be told to move to the Kotel [i.e. Western Wall] square [which had quickly replaced a destroyed Arab neighborhood, the Mughrabi Quarter (tp)]. The ministerial committee in charge of maintaining holy sites asked Dayan to instruct Goren, through [Yitzak] Rabin, to stop trying to take control of the Temple Mount, so as to avoid involving the IDF in a religious conflict. 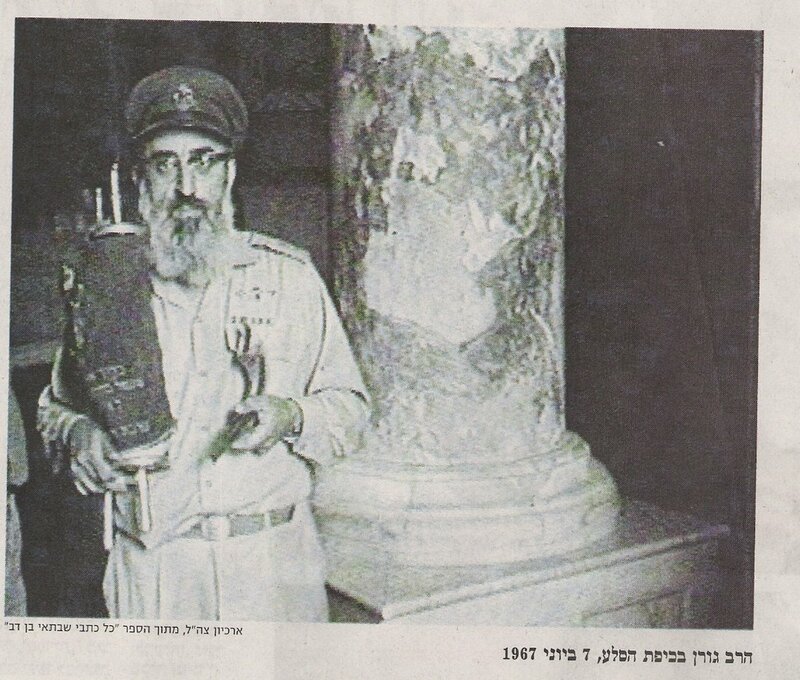 In the summer of 1983 Rabbi Yehuda Getz, the former Rabbi of the Western Wall, (he died in 1995) broke through the Western Wall deliberately excavating to the East (at “Cistern 30” [the space behind the blocked “Warren’s Gate” -tp]) in their newly excavated underground tunnel which runs under the old city… Getz hoped to eventually reach the foundation of the Second Temple. During this tunnelling, Rabbis Getz and Goren claim to have seen the Ark of the Covenant according to statements they later made to the press. However the Waqf guards on the Temple Mount discovered the underground activity and soon sent down some young men through cistern entrances above to “discourage” the work. A fist fight ensued and the episode concluded with the sealing of the wall with six feet of reinforced cement. 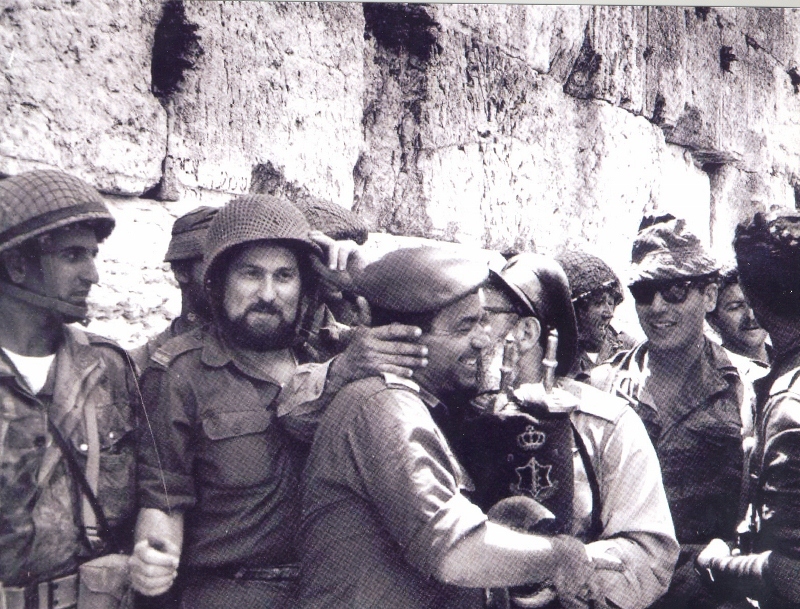 This entry was posted in Israel-Palestine Scene, Jerusalem People, Modern History, Stamps and tagged 1967 Six Day War, Dome of the Rock, Haram al-Sharif, Jerusalem, Modern history, Rabbi Shlomo Goren, Rabbi Yehuda Getz, Temple Mount, Western Wall Tunnels. Bookmark the permalink.